Ever dreamed of a new life in Spain? These three hilarious bestsellers might make you think again. Award-winning author Joe Cawley suffered calamity after calamity when he took on a bar/restaurant in Tenerife. New York Times bestselling author Victoria Twead became a reluctant chicken farmer and subsequent owner of the most dangerous cockerel in Spain. Alan Parks decided that buying an off-grid olive mill and raising alpacas was a perfectly logical thing to do. Did the authors’ businesses, relationships and sanity remain intact? Or did they give up and head for home? 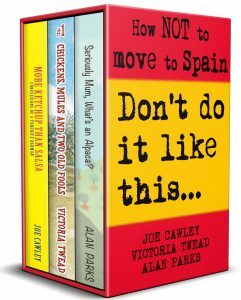 If you like true life stories about chasing your dreams (however zany), or have ever thought about moving overseas, this funny travel memoirs boxset is just for you!